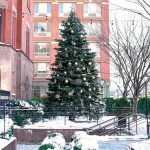 On November 28, 2018, Santa and Mrs. Claus will plug in a 25-foot fir decked in technology-inspired style to celebrate the Chelsea home base of Google, WeWork, Twitter and IAC. New York City’s holiday season officially logs on at the annual Christmas Tree Lighting at The High Line Hotel in Chelsea on Wednesday, November 28, 2018. Trimmed in the front garden of the 1895 Collegiate Gothic building where Clement Clarke Moore wrote the classic poem “‘Twas the Night Before Christmas,” this year’s 25-foot concolor fir will have a technology theme paying homage to West Chelsea’s status as a world-renowned technology hub. (Last year’s tree theme was vintage Christmas, honoring the hotel’s storied history.) Brand new ornaments and sparkling LED lights will complete the theme. But old-fashioned fun will power the evening. Join friends and neighbors from 4:30 PM to 6:30 PM for crafts, carolers, sweet treats (gingerbread! hot chocolate from NYC’s only Intelligentsia outpost!) and hot toddies. Santa and Mrs. Claus have even agreed to pose for selfies that sleigh (er, slay). 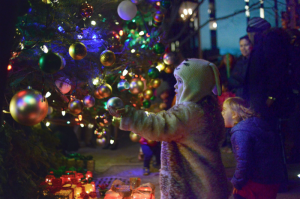 The lights go online at 6 PM – and you won’t have to battle the crowds in Midtown clamoring for a glimpse of that other tree lighting. The High Line Hotel’s 25-foot-tall concolor fir was planted in the early 1990s – right around the birth of the World Wide Web – at Domes Tree Farm in Bliss, New York, roughly 330 miles from New York City. The evergreen is famous for its citrus-scented long needles.